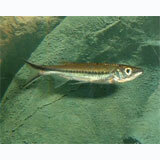 The Apollo Shark is a very active schooling fish that is suitable for the mature community aquarium. This sleek shark is more passive than either Black Sharks or Red Tail Sharks. The Apollo Shark requires an established planted aquarium with plenty of free-swimming space available. A hood on the aquarium is also recommended, as it is an accomplished jumper. An omnivore, the Apollo Shark is not a particularly finicky eater. Ideal foods should consist of high quality flake food, freeze-dried bloodworms or tubifex, and pelleted foods, as well as vegetable-based foods. Ideal tank mates are Barbs, Gouramis, Rainbowfish, South American Cichlids , Plecos, Scavenger Catfish of similar size.